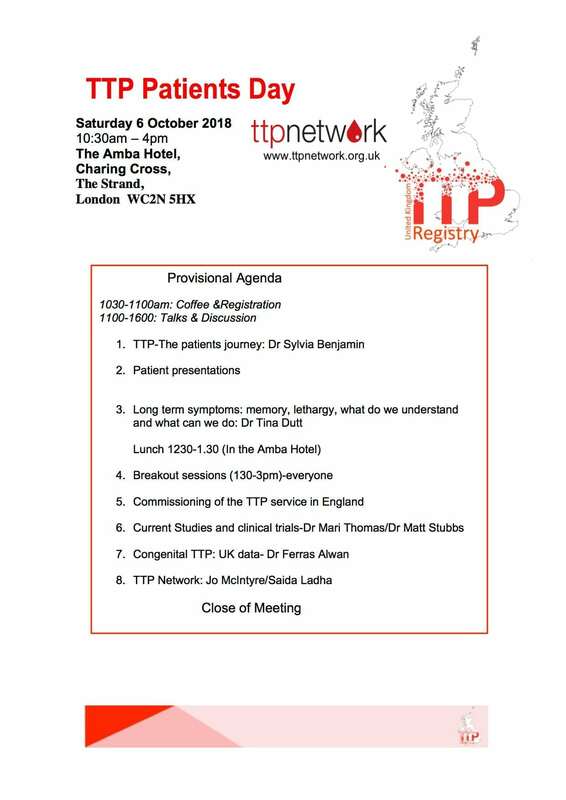 The TTP Patient Day will include guest speakers, a buffet lunch and an opportunity to meet other patients. There will also be the chance to put forward your questions to a panel of speakers and get the latest information about TTP treatment. The cost is just one fee of £5 for you and your guest(s) this could include your partner/family. Please email the organiser after purchasing your ticket with the name of additional guest(s) and any special dietary or other requirements. You can do this by clicking on ’Contact’ button which gets to the Q&A page. At the bottom of the Q&A page you can click ‘contact the organiser‘ and provide the name of additional guests. Use this message to also let us know of any dietary or other special requirements. This event is organised by University College London Hospital (UCLH) in conjunction with TTP Education and Research. The UCLH team treating TTP and medical professionals from other hospitals will also be present. Please download your copy of the Minutes HERE.